External voltage regulator, 24 volt. Tractors: 720, 730, 830, 3010, 3020, 4010, 4020. Use with Delco generators 1103021 or 1103026. 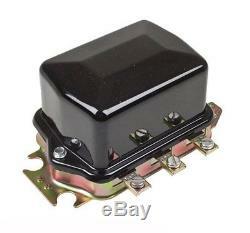 The item "VOLTAGE REGULATOR John Deere 3010 3020 4010 4020 720 730 830 Tractor" is in sale since Thursday, June 19, 2014. This item is in the category "Business & Industrial\Heavy Equipment Parts & Accs\Antique & Vintage Equip Parts". The seller is "justauctions" and is located in Sparta, Michigan.